Welcome to St. Thomas the Apostle School, where we are privileged to partner with parents to develop and nurture each child’s God-given talents. 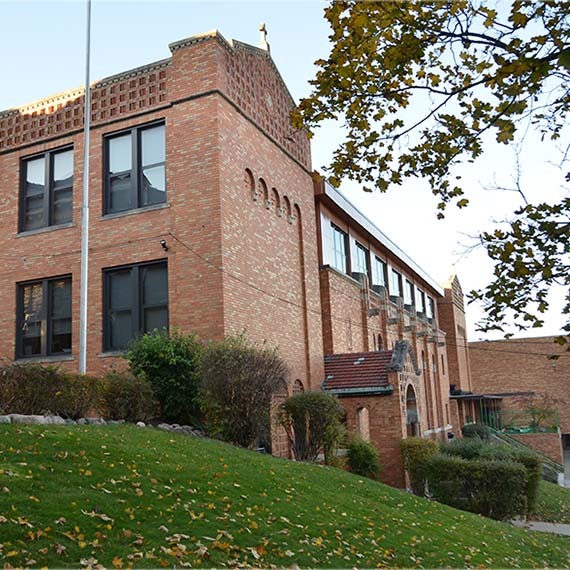 Founded in 1868 and housed at our historic site in downtown Ann Arbor, we are excited to serve 210 students in preschool through 8th grade by offering excellent academic programs while preparing students to become the saints, martyrs and apostles the Lord has called them to be. Our faith-centered learning environment, individualized learning plans, advanced curriculum for gifted and high achievers and joyful atmosphere continue to attract a range of culturally and ethnically diverse families who care deeply about their children. Located near the campus of the University of Michigan, we are able to take part in many educational opportunities offered by the university, and provide service to our urban community. If you are looking for a school where your child will feel loved and challenged in a fun, faith-filled environment, please join us! Enlightened by the Gospel of Jesus Christ, informed by the wisdom of the Catholic Church, and in partnership with families, St. Thomas the Apostle strives to provide each student with a strong foundation of faith, academic excellence, and virtue for living generous lives of love for God in service to their communities. St. Thomas has a reputation for academic excellence and use of best practices. Our students are taught by experienced, highly qualified teachers who have perfected their craft and know how to teach to each child’s individual needs. 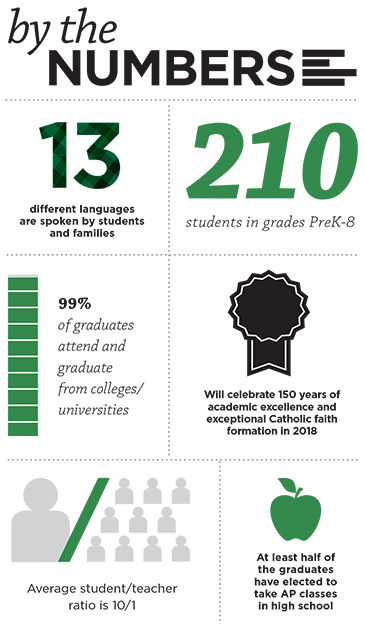 We also have outstanding standardized test scores, and many of our students go on to become top graduates of their high school classes. Our rigorous curriculum includes core courses in math, science, social students, reading, writing and literature. We also offer students Spanish, music, band, choir, technology, art and physical education. Our curriculum builds on the basic fundamentals, with a common thread continuously woven and reviewed through the learning materials presented from preschool through the 8th grade. Students at St. Thomas the Apostle are encouraged to live out their faith through daily prayers and in rich, sacramental experiences that include weekly all-school Mass, biweekly Mass for individual classes, eucharistic adoration and reconciliation. They also participate in sacramental preparation and other faith-based activities throughout the year, and have a strong commitment to Christian service projects. Religion class is part of our regular curriculum for all grades. In addition, our behavioral programs are centered on virtues. We focus on inspiring students to a higher calling of personal integrity. Many of our extra-curricular activities at St. Thomas are designed to encourage the development of the whole person, and to do this while having fun. Along with enrichment activities such as the National Honor Society and Science Olympiad, we offer band, choir, a violin program and even a Minecraft club. We also offer an inclusive athletics program that encourages and promotes an active lifestyle beyond the students’ elementary and middle school years. Sports teams for students in 5th – 8th grade include girls volleyball, and boys and girls basketball, cross country and track. Our families also enjoy participating in the monthly social events sponsored by our active parent/teacher guild, including meet and greet activities, family outings and a fundraising auction. If you are interested in sending your child to St. Thomas but are concerned about the cost, come talk to us. Scholarships, family discounts, tuition payment plans and other options are available to help make it possible.